Bio-Beaute by Nuxe Rebalancing Range brings combination skin into perfect balance! 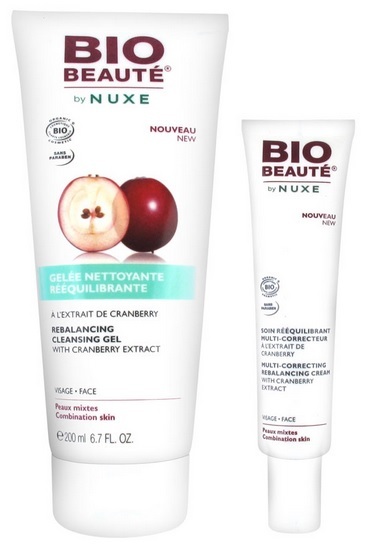 Bio-Beaute by Nuxe Rebalancing Cleansing Gel - 200ml - $22 - a rinse off, sulfate-free gel that gently cleanses while removing impurities and excess sebum leaving skin clean without drying. Bio-Beaute by Nuxe Multi-Correcting Rebalancing Cream - 40ml - $31 - a non-greasy cream that absorbs quickly and moisturizes for 8 hours while at the same time mattifing and correcting all skin flaws including imperfections, blackheads and dilated pores. With organic apple cryo-extract to promote the release of B-endorphins to improve the skin's comfort. With regular use you can look forward to skin that is softer, healthier an clearer; with excess sebum eliminated and improved skin quality.